While spring is on the horizon, February in Prague is still quite cold, and there is always a chance of snowfall, but if you are planning a trip to this historic city this month, there is a chance you may be treated to the annual pre-Lenten celebration of Carnival, done Czech style. Still, the weather is typically cloudy, even if it isn't snowing, and temperatures stay around freezing throughout the month. As a result, you'll need to make sure you know what to pack so you can enjoy the most of your time in the capital of the Czech Republic. 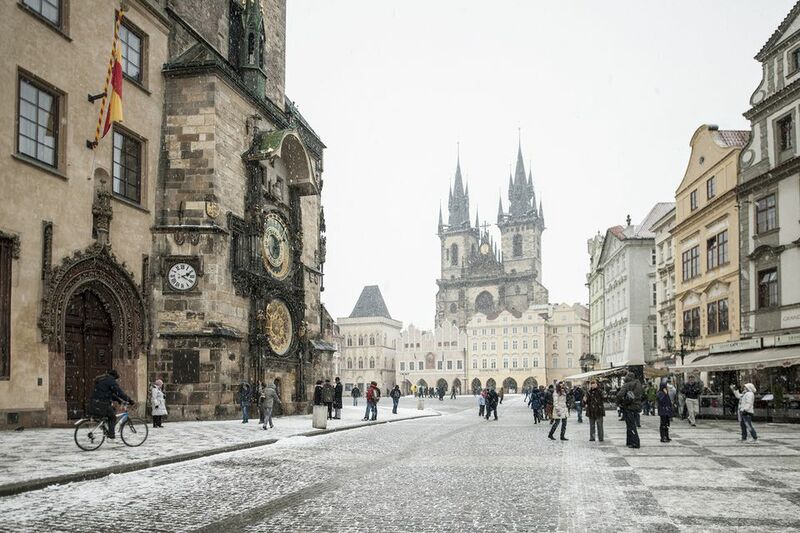 Prague experiences relatively cold,​ winter weather all February long, with an average overall temperature of 33 degrees Fahrenheit (1 degree Celsius). However, the city has also been known to experience temperatures as low as 12 degrees Fahrenheit (-11 degrees Celsius) and as high as 51 degrees Fahrenheit (11 degrees Celsius). You can generally expect 12 rainy days and 11 snowy days throughout the month accumulating a total of less than an inch of precipitation between them. Although days are still relatively short during the first half of the month, with approximately nine hours of daylight, they lengthen significantly by the end of the month, adding an extra hour and a half to the day by the end of February. However, due to the typical overcast weather, the city only sees about four hours of sunshine per day with partly cloudy skies obscuring most of the sun. If you are venturing through Prague in February, pack warm clothes, especially if you plan to take in any of the city's outdoor sights. Since temperatures rarely reach above 40 degrees Fahrenheit (4 degrees Celsius), you won't need to worry as much about layering to adjust for warmer weather, but you should pack plenty of sweaters, long-sleeved shirts, pants, and a warm winter coat. Thermal leggings and undergarments may also be required on colder days. Additionally, you'll likely need to bring waterproof shoes, an umbrella, and a raincoat since the city receives precipitation a little more than half the month. From costumed celebrations in honor of the Czech Carnival and Lent to Valentine's Day parties at local restaurants and venues, there are plenty of things to do on your trip to Prague this February. Whether you're a fan of history, culture, or just having a good time, these annual events and activities are sure to make your vacation memorable. Masopust (Carnival): Like many Eastern European cultures, Czechs celebrate and indulge their appetites in preparation for the sacrifices expected during Lent. Also known as Czech Shrovetide, this celebration begins a week before Ash Wednesday and is a time for feasting, revelry, dressing in costumes, and wearing masks. Zabijacka (Pork Feast): The traditional pre-Lenten meal in Prague, which is served with sauerkraut and generous quantities of drink on the night before Lent begins. Public hog feasts are held in Prague for visitors to attend, so if you really want to get into the local culture, seek out one of these feasts during your visit. Valentine's Day: Although not celebrated as widely as in the United States, many hotel and restaurants in Prague offer Valentine's Day packages and specials. If you are looking for a romantic Valentine’s Day gift, Czech garnets are considered among the finest in the world and can be found in jewelry stores around Prague, but take care to shop at a reputable jeweler as the counterfeit garnet trade in Prague is notorious for tricking tourists. Festival Mala Inventura: One of many annual art events in the city, Mala Inventure features a showcase of new theatre performances held at venues around the city throughout the month. Victorious February: A date celebrated by Czech communities for the 1948 Czechoslovak coup d'etat, when the Soviet Union-backed Communist Party officially took control of the government in what was then Czechoslovakia. You can explore many other milestones, including this one, at the ​Museum of Communism in Prague, open every day of the year except Christmas Eve. Travelers to Prague in February will enjoy lower-than-usual prices for flights and accommodations since most tourists visit during the spring and summer. Although the Christmas and holiday markets have long closed, you'll still find a few places to buy hot food and drinks to warm you up, especially at craft markets popping up throughout the month. Lent doesn't occur in February every year and, as a result, neither does the Masopust celebration. Before you plan your trip to Prague, be sure to check out when Lent starts and when the festivities begin for this annual celebration of decadence. Temperatures rise steadily over the month, so if you're not a fan of the winter cold, you may want to wait until the end of February to plan your visit.